In the Norwood Triangle of Crystal Palace is The Bookseller Crow on the Hill. This shop has been going for around 20 years. It's not been there as long as the Prince Albert pub, or the locksmith on Westow Hill, but it's been there a lot longer than many of the restaurants and bars which are constantly reinventing themselves. This is what I call a proper bookshop. The owner, Alan, seems to live and breathe books. I wouldn't be surprised if he's read most of the books in the shop, as he always knows something about any book I ask him about. He also knows a numbers of the authors. The first time I went there he gave me a book by Alice Walker. I think I had bought a Maya Angelou book so he threw that one in too. I am not sure if he ever met Maya or Alice, though. What's good about the shop is that he promotes a lot of diverse authors - folks who write about local communities in London, minority authors, or people into different hobbies. I am currently reading "Swell", a book about the history of women's swimming, particularly in lidos. Another thing I like are the various events they hold. Sure they have a book club. But they don't just do one book club. They do detective stories, fat (as in many pages) book clubs and other categories. They do book launches and readings by authors too - like what Waterstones do, but this is at a local level so you get to know folks in the neighbourhood. Plus they do writing courses. And that's where I went today. It was my first day of a six-week creative writing course, with a woman named Karen McLeod. For all the writing I do, both in my day job as a copywriter, my journalism, and this blog, I still feel the need to take courses to sharpen my game. I don't think you can get too creative with words can you? I hope to learn a few more things and delight you, dear reader, with better writing over the coming months! 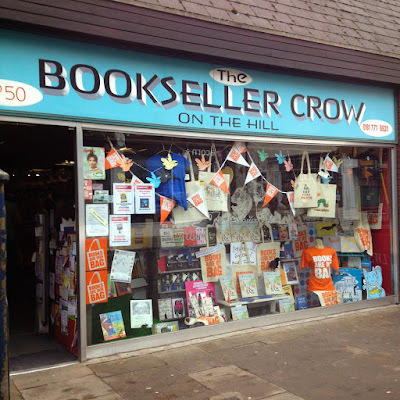 As for the Bookseller Crow on the Hill, that is definitely one to put on your list when out shopping in Crystal Palace, or not necessarily in Norwood. You can't go wrong making a trip up there.